Experience the excitement, richness and beauty of West Africa through live music, dance, art, film, exhibits, fashion show, marketplace and more at Seattle Center Festal: Spirit of West Africa, May 7th, 12 p.m. – 8 p.m, in Center House. This lively and colorful festival features traditional performances by world-class griots artists from Senegal, Ghana, Guinea, Benin, Gambia, Nigeria, Zimbabwe and Liberia. West Africa is the motherland of traditional rhythms that have given birth to the modern music of the Caribbean and Brazil and to American jazz, hip-hop, blues and rock and roll. Tightly woven polyrhythms, where each drummer plays a specific contrasting part of the larger rhythm, work together synergistically to create a river of sound that will move you to dance. Keepers of West African culture, griot families of traditional musicians, drummers and dancers, have kept this music alive over hundreds of generations. Their presence is essential to all celebrations in the lives of West Africans. It is with drum and dance that the community is united, strengthened and elevated and the rites of passage of its members lives are celebrated. 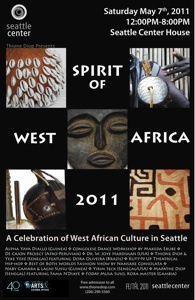 The Spirit of West Africa is produced by Thione Diop and the Seattle Center. Keep checking this site for up to date information. RSVP on Facebook or for more information directly contact Thione Diop at 206-290-5560 or thionediopmusic at gmail dot com.